The 14-28mm is a pretty short zoom range of 2x, which isn’t very practical but when used along side the 19-90mm you have an overlap of 9mm. With all three Cabrio zooms you’ll be covered from 14mm through 300mm, all at T2.9. The 14-28mm will have the same 114mm front diameter as the other two Cabrio zooms which is a great, common front diameter. The lens will weigh about 6 lbs. with the motor drive unit attached. It also features the same back-focus adjustment built into the rear of the lens and the /i metadata and LDS system in the PL mount that will offer zoom, focus, and iris position data. More details on price and specs to come. Delivery is expected to be Q4, 2013. 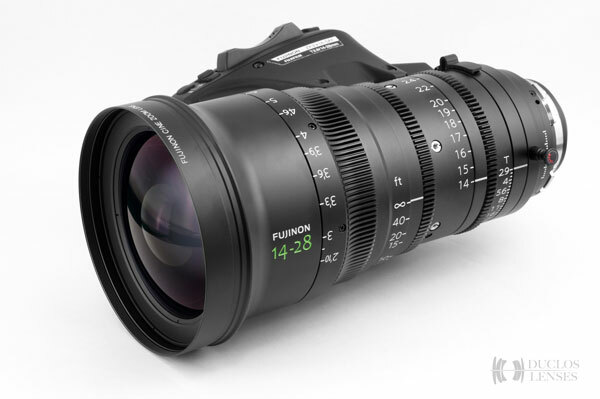 What did you mean by “With a mass majority of users who are looking for that slightly wider field of view thanks to the 5D and the larger sensor in full-frame cameras, Fujinon announced the 14-28mm T2.9 Cabrio during NAB 2013.”? The Cabrio lenses are 31mm diagonal only, nowhere near covering a FF sensor, with the possible exception of the longer end of the zooms, which will surely lack center quality. What I meant by that is that users who are coming from a 5D or expect a wider field of view, will be looking for something wider on their smaller Super 35 format sensors. This 14-28mm will fit that range perfectly.